The Division Monitoring, Evaluation and Analysis (DMEA) Team spearheaded by Dr. Melody P. Cruz, Assistant Schools Division Superintendent, together with Mr. Librado F. Torres, Chief Education Program Supervisor, Ms. Flerida Pajarillaga, Senior Education Program Specialist II, in charge in M&E, Ms. Shery P. Funcion, Assistant Principal , with the guidance of Dr. Evangeline P. Ladines, Schools Division Superintendent conducted Quarter 2 and Quarter 3 evaluations of the Schools Monitoring, Evaluation and Analysis (SMEA) on March 19-20,2019 at the Office of the Schools Division Superintendent. 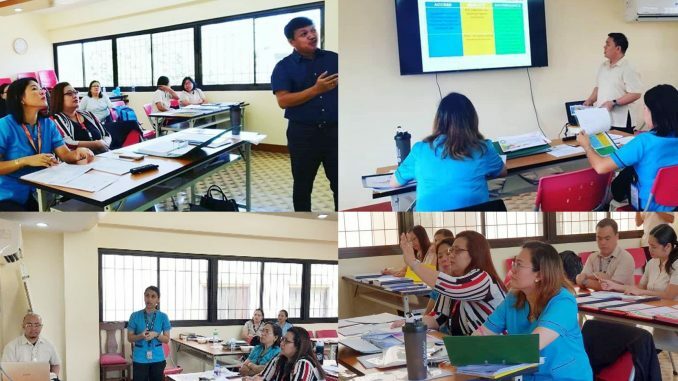 The Engagement Meeting and Technical Assistance of D/SMEA Q2-Midterm Review(MTR) and Q3-Project Implementation Review(PIR) for School Year 2018-2019 was attended by the SMEA Chairperson, the School Heads, SMEA members and Planning Team. The presenters for day 1 are from Clusters 1-5 while cluster 6-10 presented their reports on the second day. This division wide activity aims to: formulate a monitoring summary of priority programs and projects for D/SMEA cut-off period of Q2-Midterm Review (MTR) and Q3-Project Implementation Review(PIR) at the School Level, generate consolidated Division Monitoring Reports, arrive on agreement to the findings, adjustments and technical assistance needed from the monitoring officials on the Programs, Projects and Activities(PPAs) implemented by the schools. Meanwhile, the implementation of D/SMEA is in reference to the mandate of the DepEd Quality Assurance Division which ensures the provision standard procedures in the Regional Office and Schools Division Office. Hence this initiative of SDO Pasay had contributed to the promotion of accountability and transparency towards continuous improvement in all schools in the division.